When John Overman platted the town of Cedar Falls in 1853, he deeded this block to the community as the site for a future courthouse. Cedar Falls was the county seat of Black Hawk County at the time, but an 1855 election gave this distinction to Waterloo. As a result, "Court Square Park," as it was originally known, was never used for its intended purpose. Overman Park was the first public park in Cedar Falls, and the only one for a number of years. It served as the center for civic celebrations, a function it still serves during the annual Sturgis Falls Festival and other events. 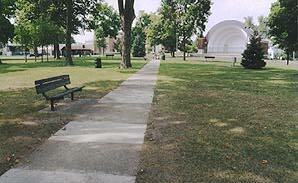 A new band shell was completed in the Summer of 1996, and features band concerts during the summer. "The park offers to the wearied in body and burdened in mind a quiet place for relaxation, recreation and rest," according to the 1893 Historical Record of Cedar Falls. The cool refreshing shades of the place are Mecca’s much sought by all classes of people." This description of Overman Park is still appropriate today.